In the spirit for the festive season! It was an evening of great wine, great fun and festive cheer! Taste more than 30 wines from bubbly to Bordeaux. Explore some lesser known wine producing nations. Let us tempt you with something a little different! TASTE – Visit the tantilising Savoury Muffin Stand and Harry’s Chocolate Emporium. WIN! – Enter our ‘Name that Grape’ blind tasting competition – win a personalised bottle of wine! INSPIRE – We have some fabulous gift ideas for you to hit the ground running! We will be raising money for Merton Vision on the evening – all proceeds from the ‘Name that Grape’ will go to the charity plus donations from Hannibal and his partners. Tickets £15 – includes tasting 30 wines and entry into our prize draw to win a personalised bottle of wine worth £35. 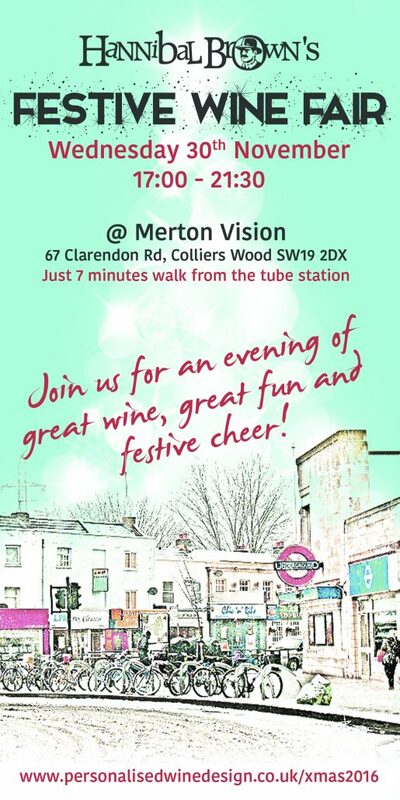 We will be raising money on the evening for Merton Vision. All proceeds from the ‘Name that Grape’ competition and also donations from Hannibal and his partners will go to the charity.